Nitrous Express Nitrous Kit - Direct Port - Shark System UNIVERSAL - Lightning Motorsports - Selling Speed since 1996 ! Shark, the ultimate predator, steely eyed and fearless, the NX “Shark” nozzle system, ditto! 800 available horsepower, gasoline or alcohol, if you want the ultimate weapon this is it. The patented NX “Shark” nozzle has proven to be the best on the market today, just ask all of our competitors who sell a copy of it. 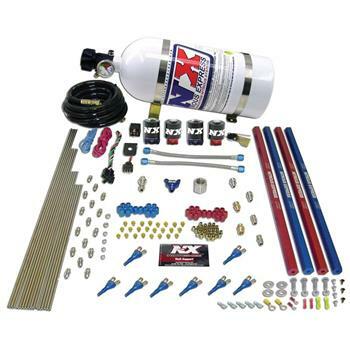 Options include “Showerhead” distribution blocks, or “Next Generation” rail technology, standard dual Shark nitrous “Ice-Man” solenoids or a the “Super Shark” monster nitrous solenoids. Standard 200-600HP jetting included.